To assess impact, you need to know where in your value chain you are creating and diminishing value, and to whom. An example of how we analyze impacts along the value chain. Nike’s stock price, which had been rising relentlessly, plummeted as stories about sweatshop suppliers surfaced end ‘96 – ’97. It took Nike years to recover the value through intensive investments in cleaning up its supply chain. As Hannah Jones, Nike Director of Sustainability, told her board: "If we're going to be naked, we'd better be buff." When your customer demands change. Now. Nestle learned a similar lesson when Greenpeace targeted KitKat in 2010, for working with Sinar Mas, a company that cut down rain forest to produce palm oil. 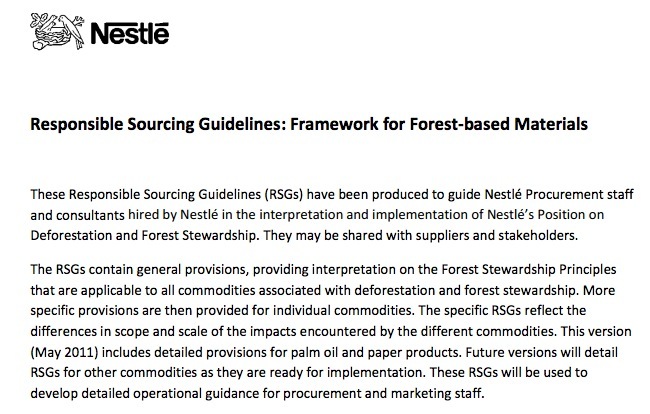 Within months, Nestle had changed their procurement policy for all forest products, paper, oil and nuts included. But it's Nestle's suppliers that now have to implement the changes - and (at least to them) unexpectedly. We take a look at where in your value chain you are creating and diminishing value, and to whom. Then, we translate that into business value and business opportunities. Armed with this, you can focus on the impacts that really matter to your business so you focus where you get the best return.